The massive and complex process of change in East Asia over recent decades has brought about a transformation in the nature of law and legal institutions in the region. Whilst the process of change has to some degree mimicked western models of law and legal change, there have been significant differences in approach due to the different social foundations of East Asian societies. The more obvious of these has been the variety of ways in which rule of law ideas have been adopted in many East Asian countries where the role of the state is more dominant when compared with Western models. 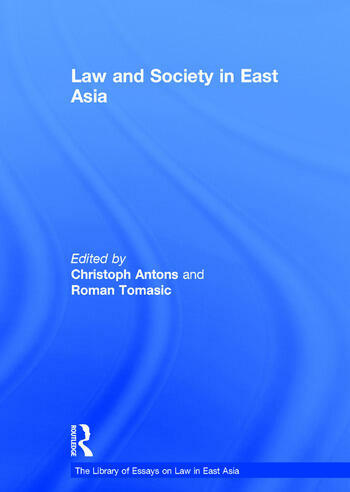 This volume brings together a selection of the most important writings on East Asia of researchers in recent years, and shows the broad range of questions which researchers have been addressing about the effect of law reform and legal change in societies dominated by traditional values and political forces, and at a time of massive economic change. Christoph Antons is Chair in Law at the School of Law, Faculty of Business and Law, Deakin University, Australia; Chief Investigator, ARC Centre of Excellence for Creative Industries and Innovation; Affiliated Research Fellow, Max Planck Institute for Intellectual Property and Competition Law, Germany. Roman Tomasic is Professor in the Law School at Durham University, UK.